Sorry for the blog absence! We've been crazy busy the last few months. We literally have hundreds of photos we are waiting to get back from the photographer that we can't wait to share but for now we want to share one of the great projects we've been working on. We've been working with a lovely family who finally closed on a home they'd been waiting months for. They loved the home and the location but knew it was going to need a lot of work to bring it new life and feel like their home. The entire house is getting refreshed but today we wanted to share our plans for the entry, front room, and family room. This is the view when you first enter the house. The detail on the staircase is amazing and we knew it had to stay (although it will be getting a facelift too). The faux finish, light fixture, and floor medallion had to go. A theme throughout this project is mixing elegance with unexpected details and bits of glamour. We though a curvy settee nestled into the staircase would be inviting and bring some softness into a space full of hard finishes. The space also desperately needed a rug but we aren't huge fans of round rugs and a rectangle rug didn't fit the space right. We originally thought the organic shape of a cream cowhide would be the perfect solution but the man of the house vetoed it (that was actually the only thing he put his foot down on) but he was a-ok with a sheep skin. The texture is going to be beautiful in the space. The last big element in this space is the chandelier. The space right now has a very formal feel to it which didn't suite this fun family at all. A blown glass fixture was just the piece it needed. It adds some whimsy and is definitely unexpected. The boys are going to have to stop throwing balls off the balcony once this puppy is installed though. 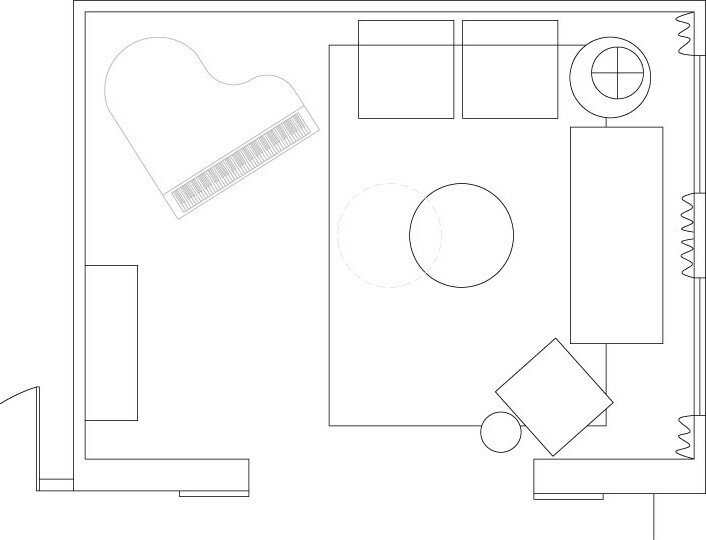 The first step we tackle when working on design plans is the furniture placement. This room is getting a pretty grand piano so we designed the room with that as a focal point. We divided the room into 2 areas: the piano area, and the sitting area. The furniture we picked for this space is a bit on the feminine side with gold and glass accents. We fell completely in love with a wool and silk rug in rich navy and gold and built the color palette around it. One of our biggest dilemmas in this space was whether or not we should keep the wood trim. Most of the trim in the house is paint grade but there were some great wood details. Originally we were thinking painting them white would be great but after a visit to the open house for the Odgen LDS Temple our client fell in love with the light muted tones of blue and cream mixed with rich wood finishes. So the wood arches get to stay but with a bit of a freshening up. This space is getting a large built in for the TV on one wall and with the fireplace (which is also getting a new look. Think cream stacked stone floor to ceiling) and windows on the other wall an extra long sectional seemed like the perfect fit. The furniture needed to be check several boxes: right scale, comfortable, durable, elegant. We think our selections managed to check off each box. This was such a fun project to work on and we couldn't be more happy with how everything is coming together. Construction has begun and orders have been placed and we are trying to wait patiently for installation day. We will share photos of the completed space as soon as we them. Check back soon for some pictures of what we've been working on for the past few months. We should be getting the images back fro the photographer any day now.